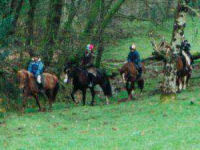 Riding experiences around the UK with YOU in the saddle! Change sort to price, location, county. 150 minutes, with 2 hours in the saddle. On arrival you will be matched with a suitable horse/pony then you will be off for a 2 hour trek up onto the edge of Bodmin Moor. Steeped in history and all the ruins from the now extinct tin mining . Valid 2 people.